Dreaming of an ideal place to take your next golf vacation? Well, the Sandhills region of North Carolina centered around the village of Pinehurst definitely should not be overlooked. There is no doubt it is one of the crown jewels of golf here in the United States, deserving the name as Home of American Golf with 43 courses within a 15-mile radius. The tradition of golf lives here on these courses roamed by legends of golf like Ben Hogan, Byron Nelson and Sam Snead. Perhaps the most revered of these courses is the Donald Ross-designed Pinehurst No. 2, which has been home to two U.S. Opens along with with a U.S. Senior Open, a Ryder Cup and a PGA Championship and will make history in 2014 by hosting the U.S. Open and the U.S. Women’s Open back-to-back. When they arrive for the majors in 2014, the game’s elite of the modern era will see a different look—perhaps a little rough around the edges– as architects Bill Coore and Ben Crenshaw have taken on a renovation projects intended to dial the clock back and restore the natural aesthetics like Ross intended 100 years ago. When the renovation is complete, the fairways will be widened to 50 to 60 yards and bordered by sandy waste areas and native wire grasses leading into the towering pines. Accurate approach shots will remain the key to finding success on No. 2. The signature “turtleback greens” that are the course’s chief defense against birdies will not be altered except for an enlargement of No. 15 to bring the front bunker more into play and a switch from Penn G2 bent to a mixture of A1 and A4 bent. The bunkers will be renovated and the tees, with the exception of No. 7, will remain the same. “We’re trying to uncover it, not recover it,” said Coore. “We’re trying to take what Ross left and perhaps bring it back to the character and definition of what was once here. In short, we’ll bring the strategy back and reinstate its character. It might be wise to wait until later in 2011 to actually schedule a round on No. 2, where the green fees can be more than $400, since it was closed during the winter and not scheduled to re-open until March 2011. There are four other Pinehurst courses (1,3,4,5), operating out of the same massive golf clubhouse filled with lots of history, available for guests of the renovated Carolina Hotel—often called the Queen of the South. 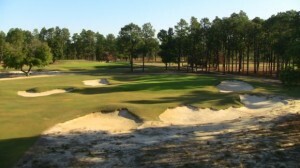 Three other Pinehurst courses are only minutes away with No. 8 being the choice of many corporate outings. No. 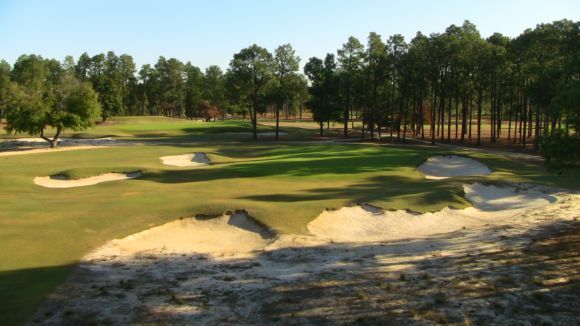 1 is short by today’s standards, but is a great place to start your Pinehurst adventure. No. 3 is also short, but has some interesting holes with character, according to Crenshaw. The greens have been renovated with bent grass. No. 4, the site of the 2008 U.S. Amateur, is not a traditional Ross design anymore as Tom Fazio re-did it in 2000, following the original routing. As Anders Bengtson and I discovered in a qualifier for the International Pairs, the crowned greens are still very difficult targets for your approach shots and the140 pot bunkers are definitely to be avoided. No. 5, an Ellis Maples design that I also played on my most recent visit, has perhaps the best variety of holes and the most water hazards to avoid. It would be on my must play list. No. 6 has been renovated by Fazio with new greens and bunker and is very challenging with rolling terrain. No. 7 a Reese Jones design renovated in 2003, is located on some of the most rugged land around Pinehurst with the added challenge of wetlands. No. 8 is a Fazio design that incorporates signature Ross features, including dips and swales around sloping greens with false fronts. With 35 other neighboring courses, many with four-star ratings by Golf Digest, you can not go wrong with a golfing getaway to the Sandhills, especially in the fall. Donald Ross’ fingerprints are also on the Pine Needles course, which has hosted three U.S. Women’s Opens. It was renovated in 2004 by John Fought, who indicated his design team had to step back in time to rediscover some of the original Ross elements. Try to also play the sister Mid Pines, another Ross creation. Little River Golf & Resort, a Dan Maples design built on an old horse farm featuring a lot of elevation changes, would be on my must play list. There are villas on the property and I was impressed with the hospitality and service provided on my visit. Talamore Golf Resort, a Reese Jones design, received rave reviews from a pair of Canadian writers attending the same conference. Next door is the member-only Mid-South Club, an Arnold Palmer design recognized by Pinehurst Magazine as the No. 1 private club in the area. While I’ve not played them myself, I’ve heard that if you are looking for something completely different, try Tobacco Road, the late architect Mike Strantz’ version of Pine Valley, or the Pit Golf Links built in an old quarry. When visiting the village of Pinehurst, be sure to stop by Tom Stewart’s place, filled with all kinds of golf memorabilia and books. The Home of American Golf awaits your next visit. I know I will definitely return to see how Crenshaw and Coore did with restoring No. 2.